To my knowledge, please correct me if I'm wrong, but I think 5e is here for a while. I know there is a new version of Pathfinder in the works but I'm not too sure when. I'm not sure where you were looking, but for all 3 core books it's not even $90. DMG - For learning tips on DMing 5e as well as being full of useful info to create adventures, this I would say get first. PHB - Help see what spells your players have and what each class does. Helpful for you to learn more about 5e. MM - While an AMAZING resource full of monsters, it can be a lot when you are picking what to initially throw at your characters. You can google most monsters and it'll help split the cost up. That's all you need to begin! It's got step by step instructions on how to play as a DM, or how to play as one of five pre-generated characters. If you want to stretch your creative muscles, you'll need the Player's Handbook for all of the base rules, including all 12 classes and a full list of spells to pick from. Why not link straight to the book for sale on Amazon instead of linking to an article about the book being for sale on Amazon? 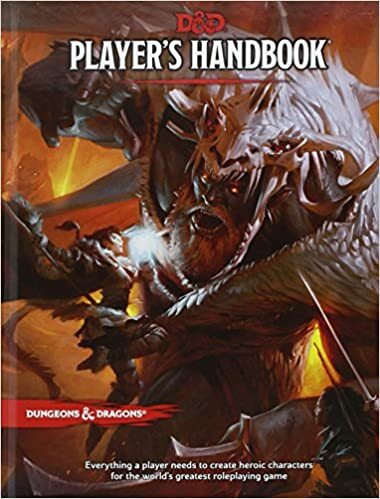 I think I saw a post that the Players Handbook is on selling on Amazon for $20.00 normally $50.00. Great news! You don't need to buy anything. You can play D&D as soon as you want without spending a dime. You can grab the free Basic Rules PDF which has the core rules and basic character generation options. You can watch tutorials like this video series. Combat episode is particularly helpful. But even so, D&D 5th Edition is streamlined and easy to learn and there are tons of people willing to help teach you. Its not a game you need to sit and read the rules from cover to cover before playing, you can very much sit down to a table as totally fresh and learn by playing--I teach people this way all the time. Consider checking out your local gaming store and see if they do any tutorials, have Organized Play, or know of groups looking for any members. > * Check in with your local gaming store. > * Search /r/LFG for posts or make one. If you end up just reading up on the rules and wanting to start your own group. I highly recommend the Starter Set . It's $15 on Amazon, has the core rules, a set of dice, premade characters, and an adventure that will last you a half dozen sessions or so. It's a great place to start--go figure--and is designed for brand new players and brand new DMs. The adventure is laid out in a way that introduces concepts as you go along rather than expecting you to know everything up front. The premade characters are big because you want to get straight to the playing not sit there explaining character creation to a brand new player. Without the context of how things are used, its just a wall of data and memorization... which isn't fun. You can always bring custom characters in once the group gets to town or something if people want, and now they'll kinda know the ropes. If you decide D&D is the hobby for you, your first purchase goal should be the Player's Handbook . Its the core rulebook with all of the default character options, spells, etc. You can try getting a replacement from Wizards like the guy said below. If that doesn't work, the 5e Handbook is only $20.98 on Amazon now. It's on sale through Amazon . Everything you need to run a game when everyone is new. Dice, pre-built characters for players to choose from, and a story for the Dungeon Master to run them through. With those you can do the same thing as the starter set but there's a whole lot more information available about all the different classes, races, weapons, combat rules, spells, etc. I'd recommend the starter set and if y'all are interested in going further getting the rest. Set aside a few hours one evening to play a session. A lot of groups will do a shorter session 0 where they discuss what characters they're going to play and make sure they've got a decent grasp of the mechanics and rules. In the course of about 2-3 hours you'll probably get through one combat encounter and one non-combat encounter (talking to townspeople, investigating something, dicking around at the tavern) but it all depends on the choices the players make based on the options presented by the DM.